The apartment has a beautiful living room carefully decorated, with two exterior windows overlooking Rafael Calvo street, where there is a small terrace. The kitchen is spacious and fully equipped. The bedrooms are interior, facing a private communal patio, so they are totally quiet. One of them has a bed of 1.50 x 1.90 and the other one has two twin beds of 0.90 x 1.90 each, the latter with en suite bathroom and dressing room. The other bathroom is independent and also complete equipped. In addition, the living room has a double sofa bed of 1.35 x 1.90, which allows a maximum capacity for up to 6 people. The apartment is located in Rafael Calvo Street, one of the most valued and exclusive areas of Madrid, a step away from the old town, museums, and all the touristic places in the capital. In the surroundings you will find many shops, supermarkets and the best bars and restaurants where you can taste the best Madrid and Castilka gastronomy. 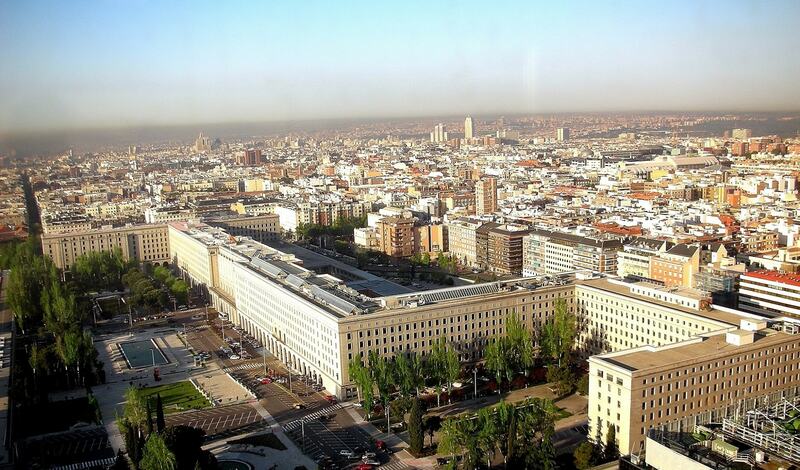 The Chamberi district is the historical centre by excellence in Madrid, an area with much from its tradition. It is located between the very central area and the Salamanca district. It is a rather central district, well connected with public transports. Both by bus and by underground you can easily get to any place in Madrid without doing any transfer. Chamberi is a district with an architectonical attraction thanks to the wide variety of neo-Gothic, modern and neo-Mudejar buildings, many of them declared National Monument. When walking through the streets we can see some palaces, monasteries, schools, hospitals and churches from other time. The most popular buildings are the house of the architect Pedro de Muguruza, the Santísimo Cristo de la Victoria Church and the Institute Valencia de Don Juan. The subway line 1, the oldest line in the net in Madrid, was inaugurated in 1919 and it has 4 stations all through the Chamberi district: Cuatro Caminos, Ríos Rosas, Iglesia and Bilbao. There Chamberi station used to be another stop on this line but it was closed in 1966. During last years it has been known as the ‘ghost station’. It was inaugurated again in 2008 but that time as the Subway Museum in Madrid. Now Chamberi is a district which has it all. As it is a large district we will find some different areas, both residential and commercial areas. The best thing is that you will stay at this district where you have everything you may need: shops, coffees, restaurants, banks and so on. Renting an apartment in Chamberi is living the very essence of Madrid city. Our luxury and spacious apartments in the Chamberi district are the ideal complement for the exceptional appearance of this area with so many green spaces, so much urban life and a rich historical architecture.